Company Name Havi Industrial (H.K.) Co., Ltd.
HOWO heavy duty truck is a new generation in China which has adopted advanced technologies worldwide with proprietary brand and intellectual property right owned by CNHTC. It aims to domestic and foreign market. HOWO heavy duty truck has excellent key assemblies and perfect technical matched up. It shows a good layout and represents the best powerful, fuel economy, reliability and environment friendly. 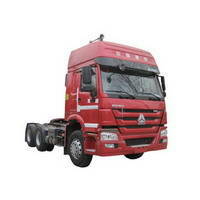 HOWO contains all types of vehicle, including tractor, lorry, tipper, concrete mixer and other special purpose vehicles. Drive types: 4×2, 6×2, 6×4, 8×4, 10×4, etc. About Havi Industrial (H.K.) Co., Ltd. Incorporated in 1997 and commence operation during the financial crisis, Havi Industrial has since built a healthy base and strong bonding with both suppliers and customers. With the mission of "FAST & FOCUS", it had been our philosophy for taking every enquiry and development with full dedication and courage, proactive to market changes, and spend substantial resources for "Marketing R&D" to stay forefront. Havi Industrial concentrate what it knows best to optimize return to its shareholder and customers. Export contributes more than 80% of group activities with good selling to more than 30 countries. Our major area of expertise is importing and exporting commercial goods from and to different countries in Africa, Middle East and Asia pacific. We are registered company in Hong Kong and we have branch office in China. We are one of the major suppliers of commodities for the companies in Angola, Nigeria and other African countries. Looking forward, we are committed to strengthen our team, improve our services, create value and growth in all 6 clusters, to build a strong partnership with our suppliers, agents, customers to deliver greater value to everyone. We are looking forward to work with sincere partners all over the world.